Protesters marched against the Maduro government. CARACAS — Clashes erupted yesterday at massive protests against Venezuelan President Nicolas Maduro, as riot police fired tear gas to push back demonstrators, some of whom threw stones or hurled petrol bombs. 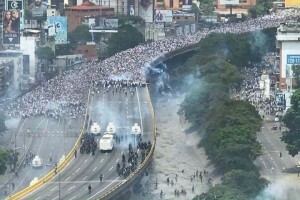 At least two civilians were shot dead: 17-year-old Carlos José Moreno in Caracas and 23-year-old student Paola Ramírez, in the city of San Cristobal, in western Venezuela; and member of the National Guard, Sergeant Niumar Sanclemente, was shot dead in Miranda state, south of the capital. Defence Minister Vladimir Padrino condemned the killings, tweeting that the three who died were “victims of intolerance and hate”. It was the largest day of demonstrations so far in a series of increasingly violent protests that have seen more than 200 people arrested since moves by Maduro to tighten his grip on power heightened the country’s political and economic crisis. The opposition says the country is on the verge of collapse. Runaway inflation is expected to top 700 percent this year, according to the IMF. The crisis escalated on March 30, when the Supreme Court tried to take over the powers of the opposition-controlled National Assembly, the only arm of government Maduro and his allies do not control. The court recanted after an international outcry, but tensions increased when authorities slapped a political ban on opposition leader Henrique Capriles on April 7. The combination of events have galvanized the often divided opposition in its efforts to force Maduro from power. In turn, Maduro has prompted his supporters, the military, and civilian militias to defend the socialist “revolution” launched by his predecessor and mentor Hugo Chavez in 1999. “The hour of combat has arrived,” he said. On Tuesday night, he activated a military, police and civilian operation called the “Zamora Plan” aimed at combatting a supposed coup attempt — which the president says is being orchestrated by Venezuela’s opposition and the United States. Seven out of 10 Venezuelans now disapprove of Maduro, according to a survey by pollster Venebarometro.